No more easy fishing. Now, you need to work if you want to catch fish. The fish are all still in the river, but, they are noticeably more difficult to catch. In my opinion, we just turned the corner from “easy” to “challenging.” It happens every year. The leaf hatch is over, the spawn is finishing up, the temps are dropping, the bugs are getting smaller, and the fish just don’t feed as aggressively. This is the time of year when what was working for the past few months suddenly stops, and, if you don’t adapt, you face the possibility of driving home from the river with the stench of skunk. I fished twice in the past week. I fished Wednesday and for a few hours on Saturday. Both days, conditions seemed ideal. Calm days with starting temps in the mid-20ss and moving up to the low 40s. The water was running around 300 cfs and temps were 43 to 44 degrees. The water was clear with very few leaves and little to no tint. On Wednesday, I met up at first light with Zach St. Amand (@fishingwithzach) on the Farmington River. We nymphed up a few fish while waiting for the Winter Caddis to start. That was the grand plan: We were hoping for the Caddis to pop off. But, the river had other plans. Now, there was a small hatch, and, Zach did well with the few bugs that got fish looking up, but, he’s a pro and is dialed-in. I didn’t make out as well on top but had fun hanging with Zach, nonetheless. After the mini-hatch stopped, Zach had to head home. So, I continued on my way hunting with nymphs. I started off with the same flies that have been working. I knew I was standing over fish but couldn’t get anyone to bite. Now, after some good drifts, you only have two options: Move or change your flies. I knew for a fact I was over fish, so I decided to figure it out before moving. I started rotating patterns and rotating patterns and rotating patterns. What the hell? I know I’m over fish but I can’t get them to eat…I know we’ve all been there and can relate. Now, you need to make some decisions. Do I keep rotating in front of fish that have seen ten different patterns or move? At this point, I decided to move to some other water I know holds fish and start the process over again. It’s important to remember we have a big river and there are fish everywhere. So, if you aren’t doing well where you are, make a move and target new fish. I see so many people get anchored down and refuse to move, and I never understand why. So, I got to my next spot and thought that with the water temp at 44 degrees, fish should still be in moderate water. Now what bugs are in the riffles? I thought Olives would make sense. Olives and Winter Caddis will be the primary bugs, and so, let’s start there. As luck would have it, that’s what the trout were looking for: sizes 18 to 20 Olive Nymphs. I couldn’t buy a fish on anything else, but, they were willing to eat Olive Nymphs. From that point on, and, even during my short outing on Saturday, my biggest producer was Olive Nymphs. From here on out, it’s only going to get more challenging. Make sure you fish water based on water temps. Get ready to start indicator-fishing slower water as the temps get into the 30s. Be prepared to fish small patterns. From here on, I’ll fish mainly Midges, Olives, Caddis Larvae, and small Pheasant Tails, along with various anchors. 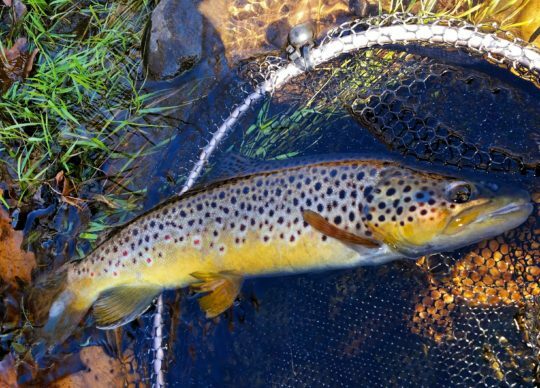 Rotate water and patterns often to stay productive when the fishing gets challenging. Breaking Off a Foul-Hooked Fish? 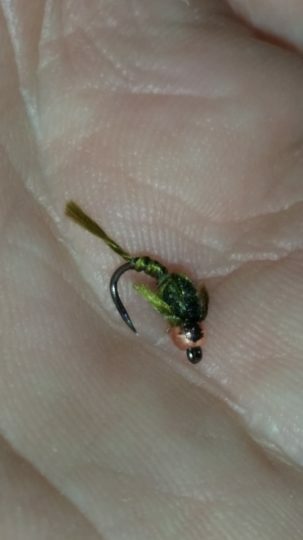 Had the same experience on Wed.Things turned around on midges in the lower TMA. Good to see you. Great that you and Andy crossed paths. Also, with the midges, were you throwing indicators or a Euro rig? Nice! Purple is “one of those” colors for me. Sometimes it works, and sometimes it doesn’t. Congrats on the success! Good to see you as well John. I haven’t done anything on midges yet…glad to hear you had some luck with them. I hope you have a nice Thanksgiving. I’ll see you on the water again. Nice report! The fishing is getting tough for sure. Hi Ashu, It sure is. It happens every year during the fall to winter transition. 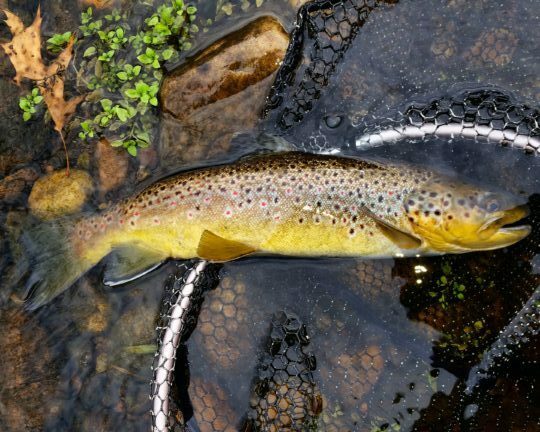 Until winter sets in fish all types of water and rotate patterns. Good luck out there! Have a nice Thanksgiving. Went to “work” in the rain on the Farmington this morning. After a few blunders, including a trip back home to retrieve my wallet, I had steady action. Fish of the day came early, a nice red-finned pre-turkey day butterball. Nice! While I was doing pre-Thanksgiving stuff yesterday, I was actually thinking: “This would be a great day to fish.” Congrats, and have a great Thanksgiving Day!